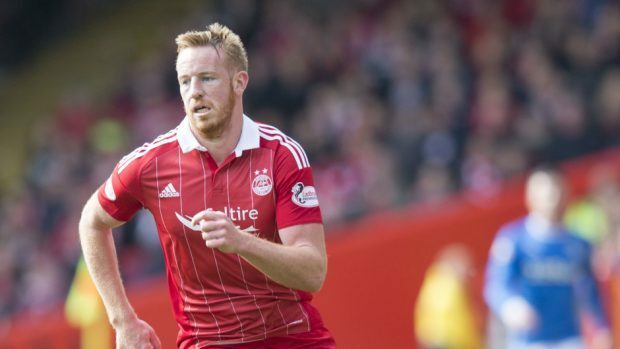 Adam Rooney’s hat-trick secured all three points for Aberdeen as they beat St Johnstone 3-0 at Pittodrie. The win takes the Dons six points clear of third placed Rangers. Dons manager Derek McInnes made two changes, both enforced, from the side which won 1-0 at Motherwell on Sunday with a wrist injury ruling Andy Considine out while Greg Tansey is recovering from hernia surgery. Adam Rooney and Greg Stewart were the replacements. Richard Foster missed out on a return to Pittodrie due to injury for Saints while midfielder Liam Craig dropped to the bench as visiting manager Tommy Wright made two changes to his side. Scott Tanser and Aaron Comrie came into the Perth side’s starting line-up. Aberdeen made a perfect start as they opened their scoring with their first attempt on goal. A quickly taken free kick from Kenny McLean ended with Stevie May crossing the ball into the box for Rooney and the Dons forward beat Alan Mannus in the Saints goal with a fine diving header from six yards. It took the home side 11 minutes to add a second and it was Rooney who struck the blow once more, heading home Anthony O’Connor’s flick-on from a May cross into the box. Aberdeen were in complete control of the game and the only surprise was that it took them until 10 minutes from time to add to their tally with Rooney grabbing his third of the game from the penalty spot after Ryan Christie had been fouled.